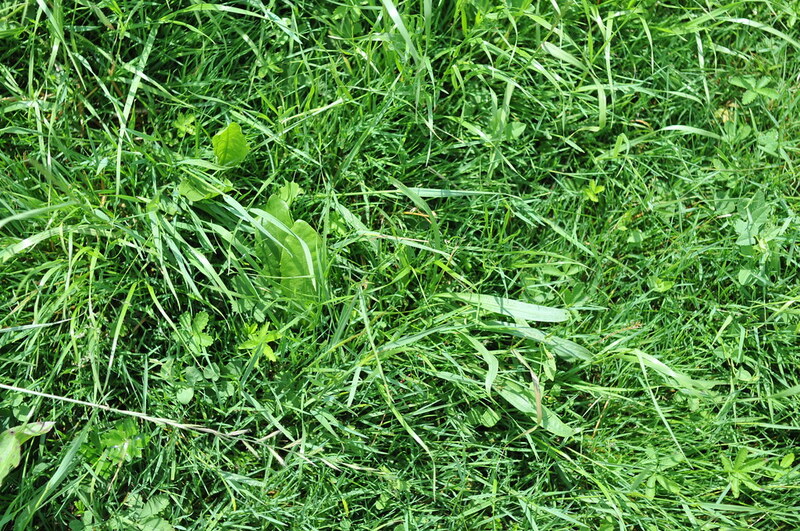 A grasspunk borrows his wife’s fancy DSLR camera and takes photos of… grass. This is the Florida paddock. It has been resting six weeks so far. There’s a whole lot of ryegrass here that has shot up this spring. 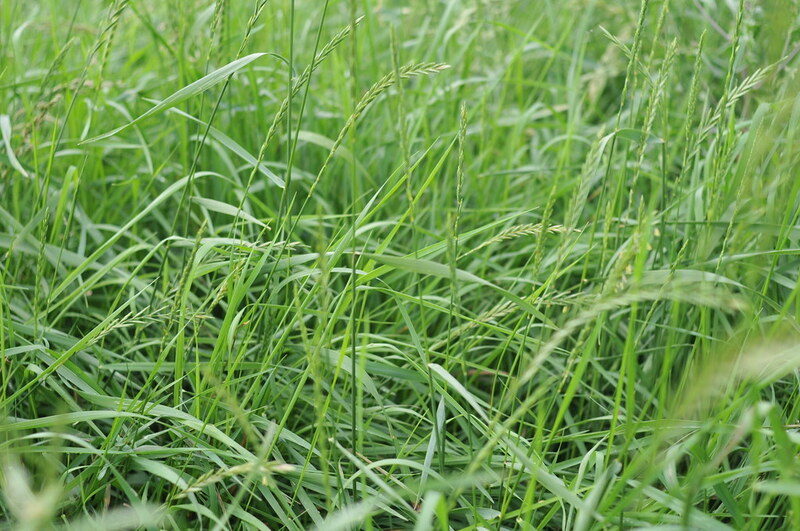 There are what look to be three or four different grasses in the photo below. 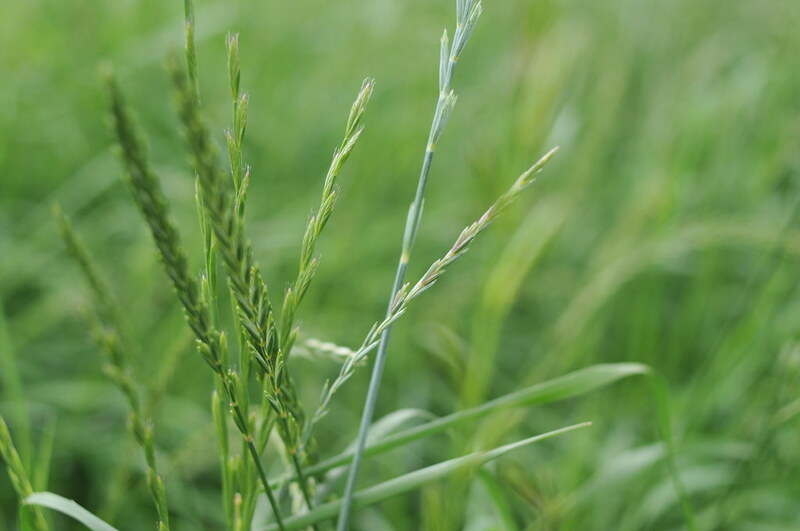 There’s a perennial ryegrass, a taller paler ryegrass and what looks to be some hybrid or Italian ryegrass. 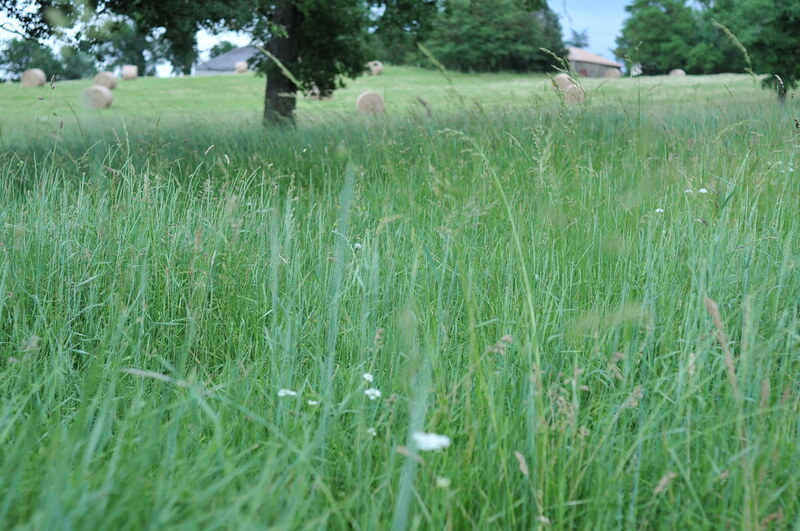 These grasses are much more numerous on the farm this year, from the rain, the mob grazing and not cutting for hay. The species diversity seems to be getting better, too. 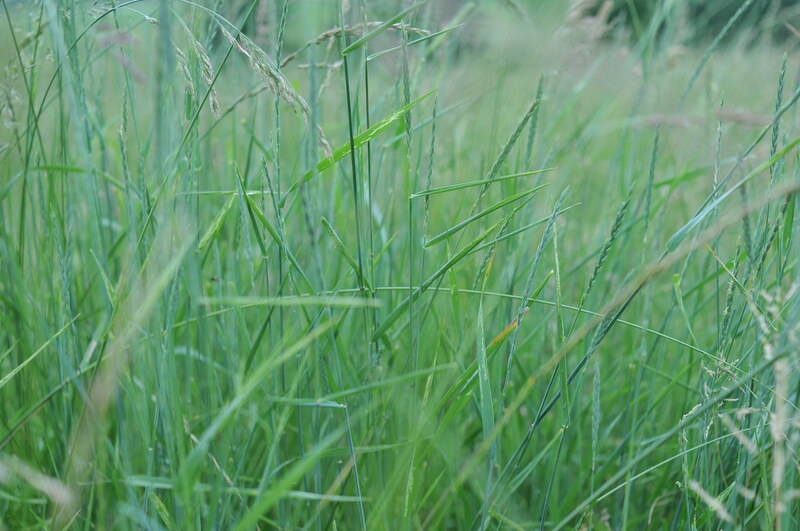 There are some of the finer grasses getting overrun by the taller stuff. 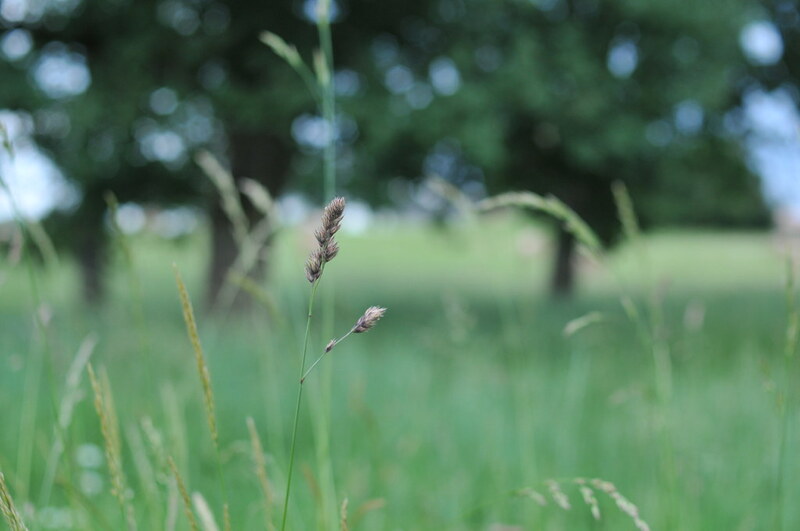 An orchard grass seed head with some fescue seed heads blurry in the background. It seems a shame to get the grass trampled down by cows, but it is the cows that make the fertility that grows the pasture. There’s a bit of blight or some form of damage on a couple of the ryegrass leaves here but that might be related to a cow eating it six weeks ago. 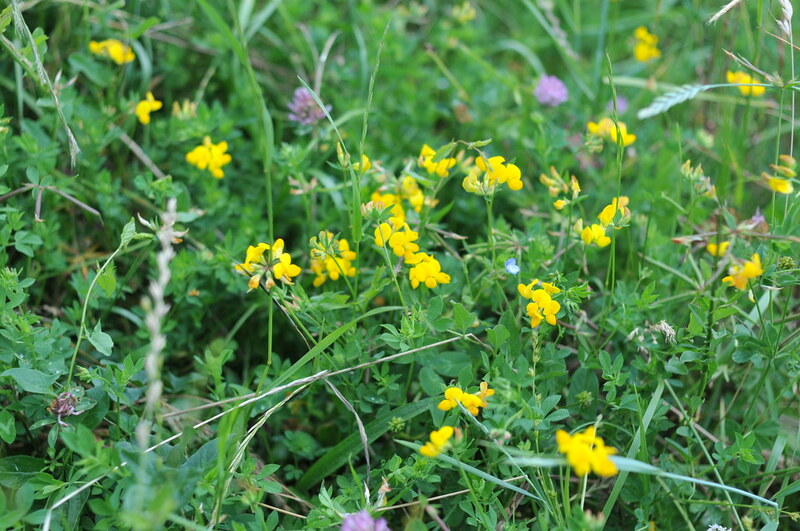 Some wild lotier, or birdsfoot trefoil, with red clover. It is easy to spot the lotier now since it has the bright yellow flowers. The full French name Lotier corniculé is pretty much the same as the plant’s Latin name, Lotus corniculatus. It is a legume, it fixes nitrogen, it has five leaves around the stem like a lotus and it doesn’t cause bloat. 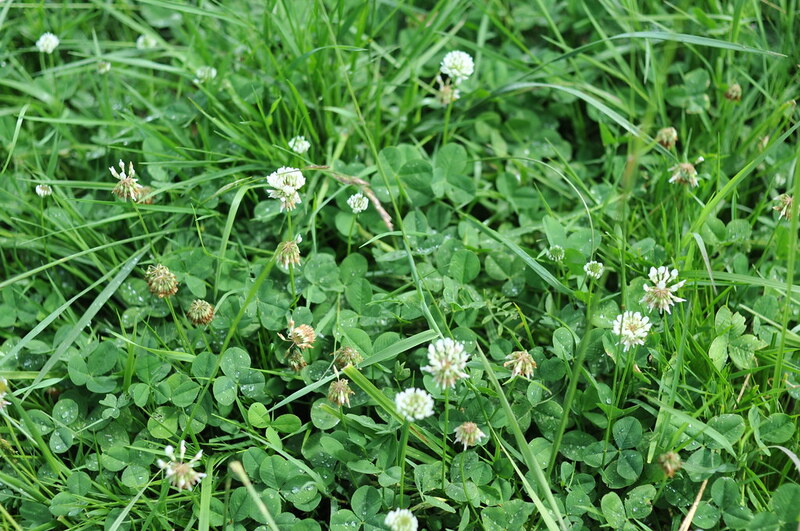 And surprise, a couple of places with white clover! The grasses are shorter here and the white clover can do well. With the taller grasses that we get from our cattle management the red clover seems to do much better, but here there’s no tall grass to take the sunlight away. Below is a broader view of Florida 4 shows all the seed heads. In winter this paddock got hit by some sanglier, the wild boar of France, and they usually go for the more fertile areas on the farm. Florida 4 is the best part of Florida. There’s an experiment going on at the moment where we fed hay on Florida 3 at 2t a hectare and fed no hay on Florida 4. We’re seeing what effect it has on the growth in the following year. Neither paddock has been cut for hay. Of course, our long term goal is to minimize hay making and feeding. With no drought and more acreage for grazing (since you can’t say hectareage) we should do better this year despite having a lot more cows. Weedy bits. 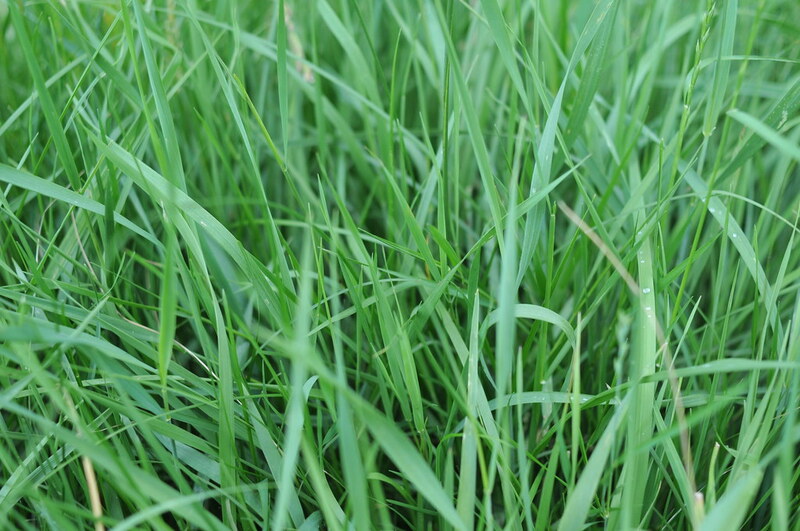 There’s a lot of this stuff around where the taller grass isn’t in full development. There seems to be some kind of succession where the slumping mossy pasture gets weeds and legumes, then the taller grasses come in and take over the sunlight. The cows seem to eat it all anyway. These were mossy areas the previous spring but all that vegetation will hamper the moss. Hmm, there’s plenty of material out there for a ‘weeds of the farm’ post. You’ve gone from a computer geek to a grass geek. I was a farmer before I was a geek, although it was listed as jackaroo, an Australian word for underpaid, overworked and mostly useless farmhand. It’s not like I remember much from back then except that in the plant and animal world sheep are very closely related to cabbages, at least mentally. trying to find out what a couple grasses in my feedlot are from hay brought in. It doesn’t look like brome, rye, Bermuda, timothy and it isn’t alfalfa, which is all I fed besides orchard grass. One has a seed head about 5″ long that looks like a cats tail in a light socket. the other is at the bottom it is a single head, then double, single, single, double on up to the top, firm almost stiff seedpods, with little stiff spikey “hairs” on them. Flat on the top side and clustery on the bottom side. Any ideas?